We are a leading manufacturer of PTFE/TEFLON Insulated Wires, Cables & Sleeves in our country. PTFE is the most useful engineering plastics. Its excellent electrical, mechanical, chemical and thermal properties, make it an ideal material for most diverse applications. 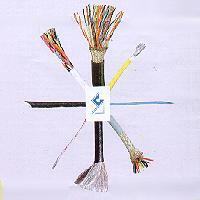 We manufacture various sizes of PTFE Insulated Wires, multicore cables, R.F. co-axial cables like RG 187 A/U, RG 188 A/U, RG 195 A/U and RG 196 A/U and also PTFE Sleeves. We are manufacturing testing these wires & cables as per the relevant MIL & JSS specifications of Ministry of Defence, Govt. of India as well as C-DOT. Our products are approved by LCSO & C-DOT and Bangalore. We are regularly supplying our products to various reputed customers or our country, namely, BEL, BHEL, ECIL, HAL, Siemens, ITI, Keltron, VSSC, GCEL, ABB and so on.